In addition to festive holidays, chilly temperatures, and snowy sceneries, the winter season also brings on an increased risk of water damage to your home. Many people believe spring and summer are the prime seasons for water damage due to excess rain and storms, but winter can be just as harsh. The mixture of cold temperatures and large, wet snows can have severe consequences. The easiest way to prevent winter water damage to your home is to plan ahead. Both frozen pipes and ice dams are tricky because sometimes the damage isn’t instantly obvious. 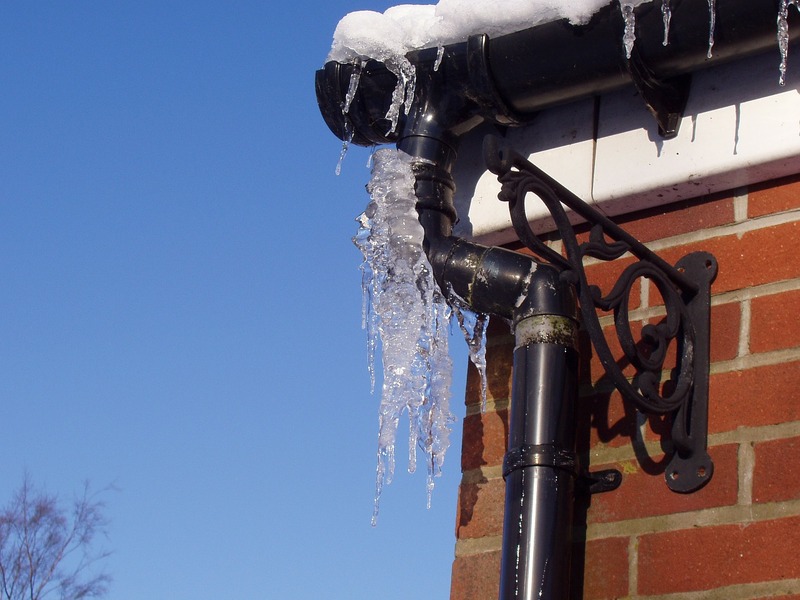 A frozen pipe could have cracked, and until it thaws enough for water to start flowing, it will not flood your home. An ice dam can form for days and slowly make its way into your roof and attic to create mold. Without inspection, it can go for years unnoticed and untreated. What are the two main causes of winter water damage? Frozen pipes and burst plumbing are the number one cause of water damage in the winter. When water freezes, its volume expands by about a tenth. Your pipes are not designed to handle this increase and will likely crack or split from the pressure. Ice dams are another leading factor to winter water damage that can often lead to leaking roofs. An ice dam is the trapped water that forms in the gutters and refreezes to form a wall or icicles. The melted water from ice dams can wreak havoc on your roof, causing structural damage and mold. Use caulk to close openings in outside walls near water pipes. Wrap exposed pipes in insulating materials. Let faucets drip to help prevent water in the pipes from freezing. When temperatures are below freezing (32 F), keep cabinet doors open to provide heat to pipes. If no one will be home for more than two days, leave the heat on no lower than 55 F.
If leaving town, turn off the main water supply. Preventing ice dams is simple. The key ingredient is to keep the roof cold. You do that by increasing ventilation, adding insulation, and sealing off air leaks. The temperature in the attic should be five to ten degrees warmer than the outside temperature. An example of an air leak would be the gap between the chimney and the house framing. Bridge the gap with L-shaped steel flashing held in place with unbroken beads of a fire-stop sealant. Also, have the gutters and downspouts cleaned, inspected, and repaired so that water will flow unobstructed. Although there are steps that can be taken to help prevent winter water damage to your home, a problem can occur at any time. Our technicians at Restoration Experts are licensed, bonded, and insured. We are highly trained and certified, and you can trust that we have the experience to take care of any frozen pipes, burst plumbing, or ice dams that you may have. Contact us for more information at 1-877-324-9982.